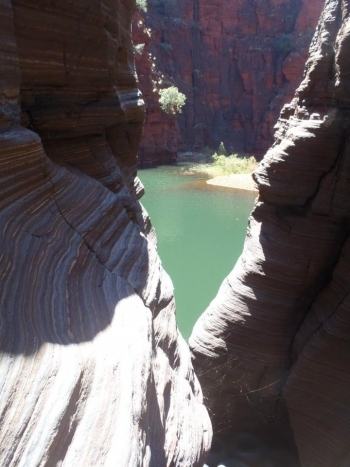 Located just north of the Tropic of Capricorn, in the outback of Western Australia, Karijini is the second largest national park in WA. Formerly known as the Hamersley Range it was named by F.T. Gregory as he explored the area in 1861. The Climate is tropical with temperatures that can reach 40 degrees Celsius. The landscape is made up of semi-desert, has a summer rainfall of 250-350mm with regular thunderstorms and cyclones. The most comfortable time to visit the park is late autumn, winter and early spring. Winter days are warm and clear however the nights can be cold and frosty. Winter is a beautiful time in the Pilbara with yellow flowers from cassias and wattles covering the landscape as well as northern bluebells and purple mulla-mulla. 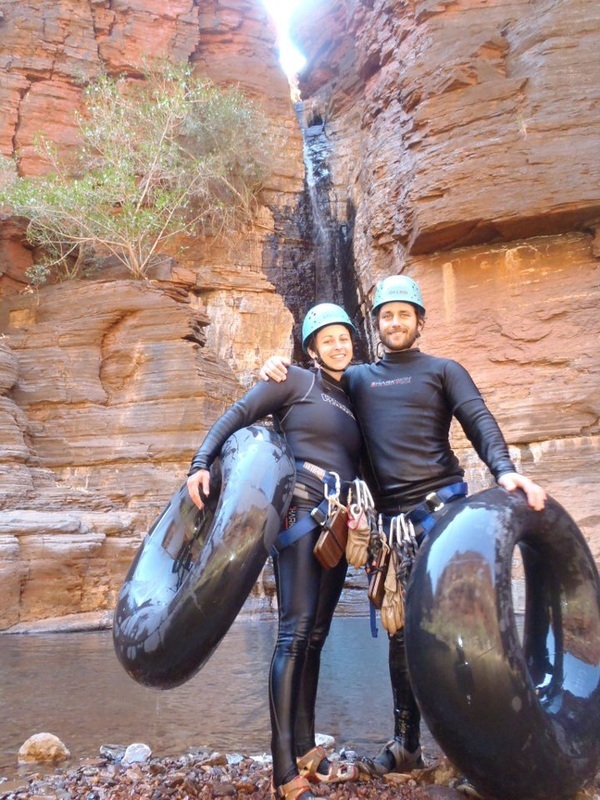 Karijini attracts nature lovers as it is home to many types of birds and animals including the red kangaroo and euros, rock-wallabies, echidnas, bats, geckos, goannas, dragons, legless lizards, pythons and other snakes. Another feature of the landscape is the large termite mounds and rock piles of the rare pebble mound mouse. 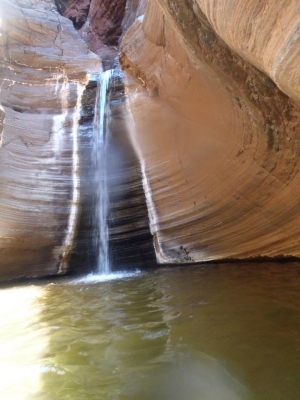 In the north of Karijini National Park you will find creek beds, dry for most of the year however after the rain they become fast running rivers that plunge 100 metres down the side of cliffs and into spectacular gorges. 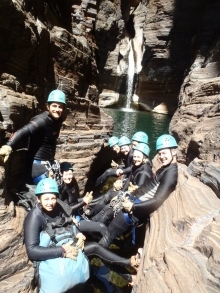 There are numerous gorges and every one is different so make sure you get around to see as many as possible. Waterfalls and swimming holes are plentiful at the gorges but please not you will need to have a reasonable level of fitness to explore these areas. 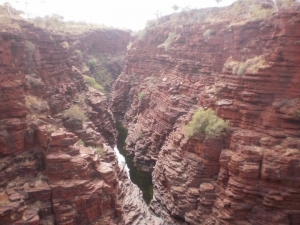 Some of the gorges include Dales Gorge, Weano Gorge, Red Gorge, Hancock Gorge and Joffre Gorge. 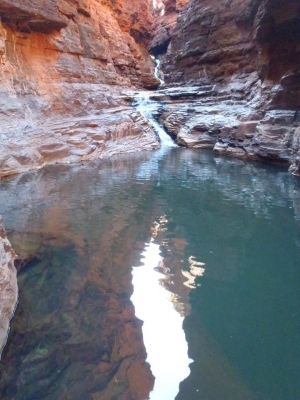 For more information on the area and what you can do as visitors to the park go to Karijini Visitor Centre. If you decide to tackle any of the walks within the park, please take great care—the gorges can be extremely hazardous. Many of them are only recommended for the physically fit and you must notify a ranger before starting any of the longer ones. It is a loose, steep descent, then an easy ramble to the hidden gardens of Circular Pool. (800m return.) This is an arduous walk, so you must allow at least 2 hours return. A 4-kilometre return trail runs along the bottom of the gorge. Allow 3 hours for the return walk. 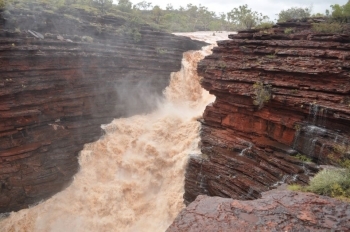 A 1.2-kilometre return trail runs along the rim of Dales Gorge. There is a 30-minute return walk into the gorge's lush, shaded pool. 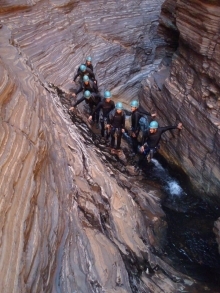 Alternatively, walk within the gorge along a stream and small ponds (3 hours return). Marandoo View is 500 metres and takes 30 minutes return. Honey Hakea Track is 4.6 kilometres - allow 3 hours return. The walk to Mt Bruce Summit is 9 kilometres - allow 5 hours for the return trip. This walk is recommended only for fit and experienced walkers. Access into this gorge is via Knox, Joffre or Hancock Gorges. Rangers must be notified before entering it. A walktrail takes you down the steep descent into Weano Gorge and through the bottom of the gorge to Handrail Pool (300m return). Please tell the ranger if you intend to walk past this point.